Gigabyte S10A Tablet PC features 10.1-inch sensor display which runs on Windows 8 OS. Well the AMD comes with Temash APU to fight against Intel's Haswell processors. The S10A Tablet PC from Gigabyte is powerd by 1GHz dual-core AMD A4-1200 Temash processor with AMD Radeon HD 8180 GPU. The S10A comes with 2/4 GB of RAM and it has 500GB hard drive for storage. It equips 1.3 MP web camera for live chatting. It comes with Microsoft Office Home 2013. Connectivity and Expansion options includes Wi-Fi 802.11n, Bluetooth 4.0, two USB 2.0 ports, microSD card slot, D-Sub, HDMI and two stereo speakers. The Gigabyte S10A comes with a standard battery which delivers 14 Hrs back-up. 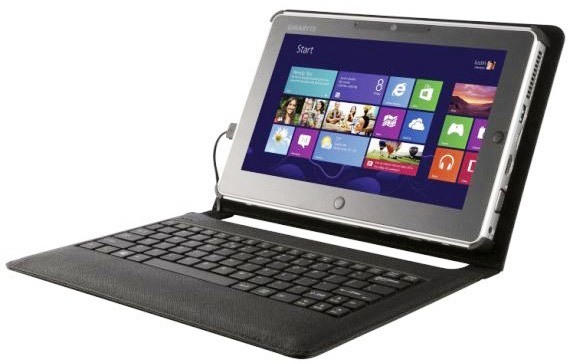 It has an optional keyboard and multimedia docking stations for the tablet. Gigabyte S10A will be available from June 2013 @ a price which is not revealed. Tags:Gigabyte S10A, Gigabyte S10A features, Gigabyte S10A specifications, Gigabyte S10A review, Gigabyte S10A details, Gigabyte S10A availability, Gigabyte S10A specs, Gigabyte S10A images, Gigabyte S10A pics, Gigabyte S10A pictures, Gigabyte S10A imgs, Gigabyte S10A price,Gigabyte S10A Network options, Gigabyte S10A Expansion options, Gigabyte S10A multimedia features, Gigabyte S10A Sensor options, Gigabyte S10A Gaming options.